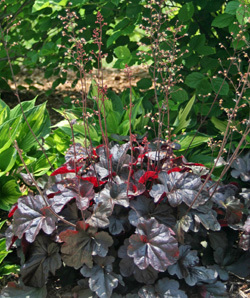 There are a seemingly unending number of forms and colors of heuchera these days. H. sanguinea, a Southwestern native, maintains its often-bright blooms through extreme drought and heat. Most do well in shady rock gardens or along woodland paths. 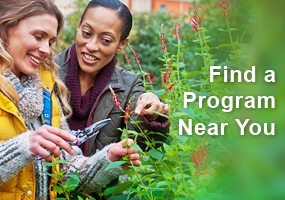 Look to bold varieties such as ‘Snow Angel’ with mottled green and cream leaves or ‘Firefly’ strain or the ‘Coral Forest’ strain with profuse scarlet blossoms. 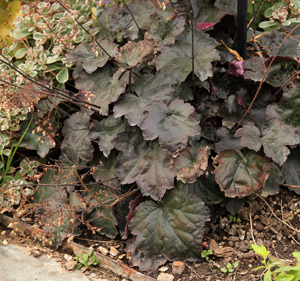 Heuchera require well-drained soil. 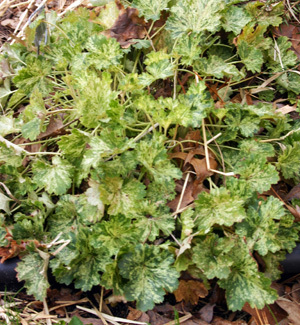 If you’ve had problems with coral bells in the past, most likely you’ve tried to plant them in soil that’s too wet or full of clay. 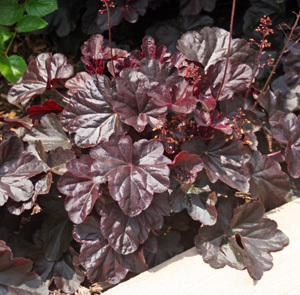 To solve that, plant your heucheras in raised beds, on a berm, or in containers. Even mounding the soil slightly where you plant them will help. 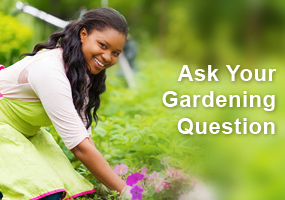 A premium organic planting compost will provide excellent drainage with enough moisture. 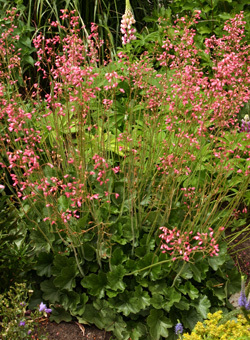 Coral bells can be bought in seed packets. These are usually H. sanguinea types and are fairly true from seed. 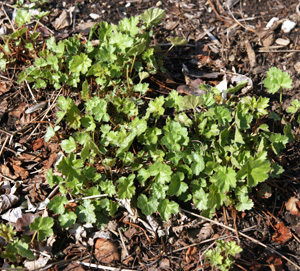 Fancy-leaved “heuchs” are grown from tissue culture and are all wide-ranging hybrids, so seedlings of these plants would be variable and inferior to the parent. 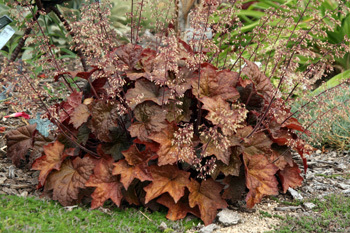 Heuchera have very fine seed and must be sown on top of the medium to germinate. Thoroughly moisten sterile seed-starting mix and then fill your seed tray to the top. Soil can be gently tamped. Seed must be sowed sparingly. Otherwise the mat of dense seedlings will be nearly impossible to pull apart. 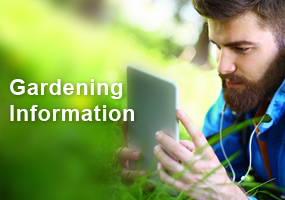 Germination usually begins after 8 to 14 days in soil that is at a temperature of 70º-72ºF. e the tops of plants falling off (from weevil damage) can pour hot water on the ground to kill existing larvae. Try pairing the deep purple leaves of ‘Dark Secret’, ‘Plum Royale’ or ‘Berry Smoothie’ with a spray of yellow coreopsis or a few choice lilies. Marry the chartreuse of ‘Lime Marmalade’ with blue bachelor’s buttons and orange California poppies. 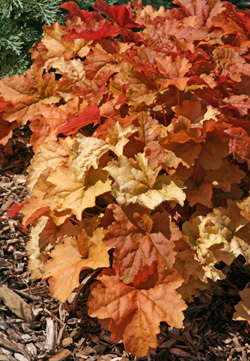 Or, arrange the bold orange leaves of ‘Peach Flambé’ or ‘Tara’ with green hydrangeas, zinnias or purple salvia. To play up the color silver, combine a silver-toned coral bell like ‘Rave On’ or ‘Silver Scrolls’ with white daisies, roses or lilies. Tulip flowers in dusky purples and black work quite nicely with dark leaved “heuchs”. European florists are rolling the leaves around roses for a cool effect. We have seen leaves used in wedding bouquets accented with Hypericum berries. 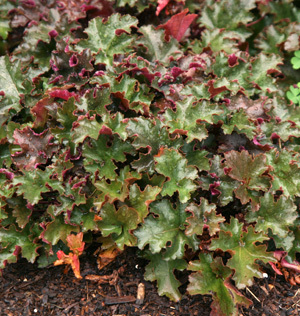 If Santa Clause’s coat is the true red, which heuchera most resembled this true red color? I don’t trust the colors displayed on my monitor. There are Forever Red, Fireturcks, Fire Chief etc… Please help!!! 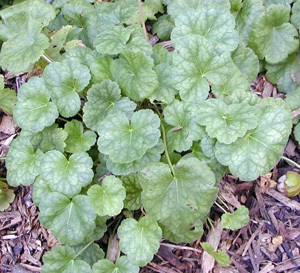 I like this plant for shady areas. I was not aware there were so many varieties. I was not aware of using the stems to stop bleeding. 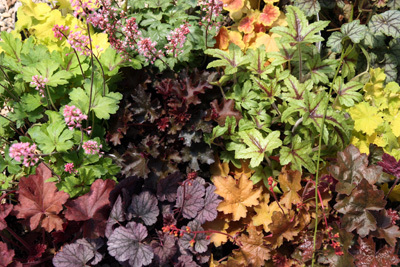 Heuchera should be in everyone’s garden. I have many varieties in mine. 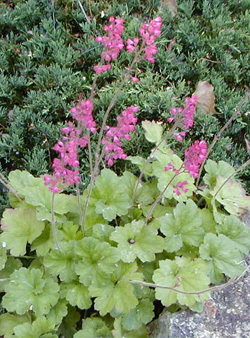 Heuchera is also know as alum root due to it medical qualities. Native Americans used them to stop wounds from bleeding. 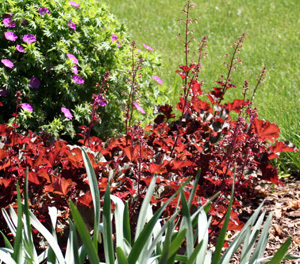 The plants were accepted as foliage plants in 1980 when Palace Purple was released.